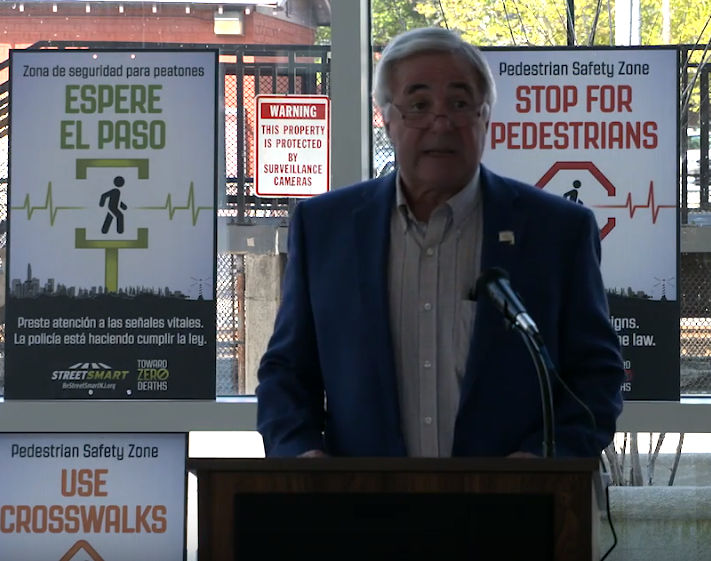 Asbury Park kicked off its Street Smart NJ pedestrian safety campaign Wednesday at its municipal owned Transportation Center located at the corner of Main Street and Springwood Avenue. The initiative is in direct response to high pedestrian involved motor vehicle crashes across the state. Moor said the campaign will work to alleviate concerns that have been brought up regarding traffic safety especially since the city continues to grow in popularity. Asbury Park had 97 pedestrians involved motor vehicle crashes from 2012 to 2016, according to Numetric – a crash analysis tool administered by New Jersey Division of Highway Traffic Safety. While there were no pedestrian fatalities during that time frame, the crashes injured 77 pedestrians and included eight incapacitating injuries. Moor said the local initiative is a collaboration with state and county officials. He thanked Freeholder Director Tom Arnone, members of his staff for their hard work in implementing the local initiative, as well as community partners like the local Complete Streets Coalition members, Lisa Lee of EZ Ride who administers the local Safe Routes to School program, and Kerry Martin of Second Life Bikes who advocates for bicycle safety. 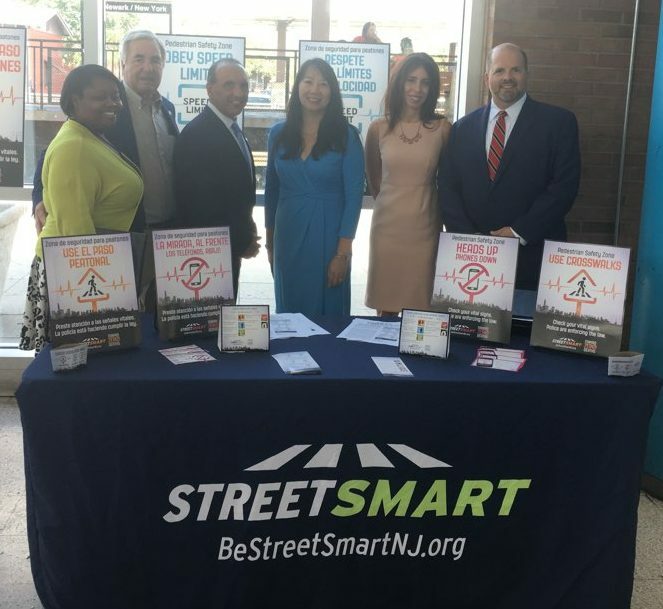 Street Smart NJ, coordinated by the North Jersey Transportation Planning Authority [NJTPA], launched in 2013 as a collaborative effort between public, private and non-profit organizations. What began as a pilot in five sites has expanded to more than 80 community partners. Their evaluations show a 40 percent reduction in drivers failing to yield to crossing pedestrians or cyclists and a 28 percent reduction in pedestrians failing to use the crosswalk or crossing against the signal. The pedestrian safety program aims to change driver and pedestrian behaviors through education and enforcement. The program roll out was intentionally done at a time when students are returning to school, organizers said. 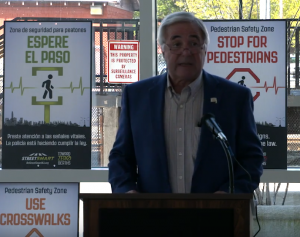 “Pedestrian safety is a top priority in Monmouth County every day, but it’s especially important as students return to school this week,” said Monmouth County Freeholder Director Tom Arnone, who is a member of the NJTPA Board of Trustees. Arnone said statistics show that Asbury Park’s revitalization translates to more people, cars, traffic and congestion. 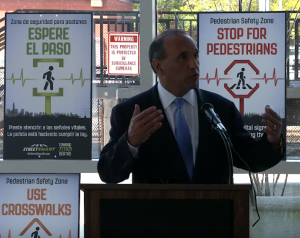 New Jersey’s high pedestrian fatality and injury rate made it a focus state by the Federal Highway Administration [FHWA]. According to State Police statistics, 825 pedestrians were killed in motor vehicle crashes from 2013 to 2017. During that same timeframe, more than 22,000 pedestrians were injured. 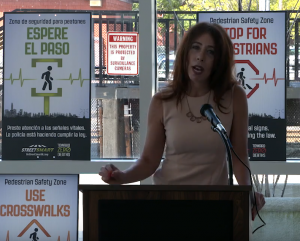 According to the National Highway Traffic Safety Administration, pedestrians accounted for 27.6 percent of people killed in vehicle crashes in New Jersey in 2016, while the national pedestrian fatality rate for that year is 16 percent. Motor vehicle crashes are also one of the leading causes of brain injuries in New Jersey, according to Wendy Berk, Vice President of Development and Communications for the Brain Injury Alliance of New Jersey. Asbury Park Police Department [APPD] distributing safety tip cards that highlight the state’s pedestrian laws and aforementioned Street Smart educational points. The APPD awareness campaign includes reminding those who traverse roadways in the city to obey State laws. Street signs with the Street Smart NJ educational points have been posted across the city. And, area businesses are displaying posters and other materials with safety messages. This includes coasters, cup sleeves and table tent cards. 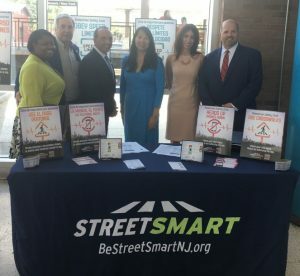 For more information on Street Smart NJ, visit bestreetsmartnj.org. For more information on the City of Asbury Park, visit cityofasburypark.com.